Blue Daisy Designs: A cold Friday! It's been a busy day today and now I'm looking forward to a relaxing weekend with some crafty time too! I've finally had a chance the play with the 3rd set by Kim Dellow for PaperArtsy. I just love these stamps and all three sets work so well together! 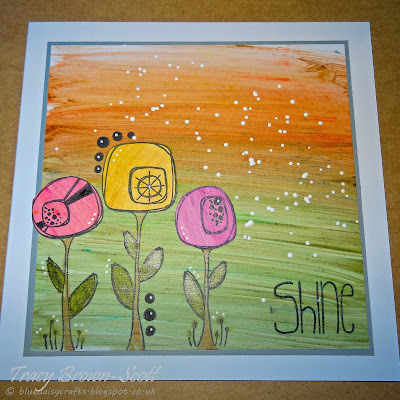 All the elements on this card are coloured using PaperArtsy Infusions and Dina Wakley Gel Medium (matte) (for Ranger). Great fun with the paint brush and using the stains kind of randomly! wow love your paint brush work, looks fabulous with your image as the background. Love it. Thank you for sharing with us here today at World Wide Open Design Team Challenge and best of luck with your entry. A sweet and pretty card! Gorgeous card..Thank you for sharing with us here today at World Wide Open Design Team Challenge and best of luck with your entry. Fab card,looks amazing. Loving the background. So cute card. I love colors! Thank for playing with us at Paradise of Stamps challenge.